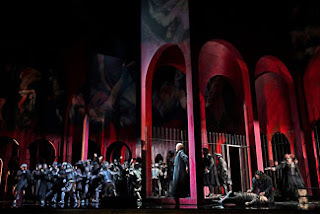 Los Angeles Opera opened it’s 2018/2019 season last weekend with a return of Verdi’s Don Carlo. It had a dream cast, even though that dream may have been from 15 years ago. In some ways that might be appropriate in that the production itself from 2006 is being revived here for the first time. And a dozen years later, the two best things about the show were still intact – the superb conducting from LA Opera music director James Conlon and the unparalleled bass Feruccio Furlanetto as the besieged-on-all-sides King Philip II of Spain. The cast also featured Ramon Vargas in the title role, Anna Smirnova as Princess Eboli and Ana Maria Martinez as Elisabeth de Valois. All of them had their moments, though the chemistry between the cast often felt lukewarm on this opening night. It wasn’t until the series of star solo moments in the final two acts that the show really started to take off when each of these excellent singers was given their chance to shine on their own unencumbered. Another big hero of the evening was Chorus Master Grant Gershon, who continues to deliver a vastly improved chorus that repeatedly stepped up to the task at hand with flair on opening night. And then there was Placido Domingo. The company’s General Director, biggest advocate and patron, and an unquestionable living legend. This production follows the model of the tenor’s performances of latter years by casting him in the premiere baritone role, in this case Rodrigo, and letting him do what he does best — provide a stirring performance with his voice — essentially what the art of opera is at its very core. That has not changed, and he is amazing to watch. He is certainly reason enough to see the show. But it is not a performance that quells all of the questions and criticisms of his output in these recent years of his career. His is not the ideal voice for these baritone roles. And when he appears as Carlos’ young, idealistic brother-in-spirit, the age difference between him and the rest of the cast is readily apparent. It’s a great wig and costume to be sure, but there is something missing chemistry-wise. And while Domingo’s vocalism goes a long was to correct that disparity, it doesn’t quite overcome it. The production, originally from Ian Judge, hasn’t aged entirely well and now looks somewhat thin and undercooked compared to 2006. The production was telecast to remote locations for outdoor audiences in Los Angeles County this year, and that camerawork may have well livened up some of the more bland moments in the house. It was certainly a nice gesture to the community from the company and one that many other companies around the world have done in recent years. The good news is that there are still 5 performances left and likely some of that opening night stiffness that plagued the first half of the evening will relax into a great show. San Francisco Opera has opened its 2018/2019 season with two productions that raise questions about the links between various operas and how those links can inform individual productions or performances. The season opened with two of the most closely linked operas in the standard repertoire, Mascagni’s Cavalleria Rusticana and Leoncavallo’s Pagliacci. These two staples of the verismo tradition have commonly been presented together due to the many stylistic and content similarities between them. But the performance precedent that binds the two works wasn’t quite enough of a connection for this 2012 production designed and created by tenor José Cura who bound the two even more tightly together by attempting to make them two acts within a single narrative. 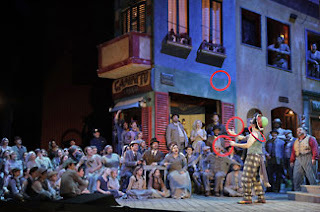 The setting is moved to La Boca, an Italian-immigrant neighborhood in 1920s Buenos Aires with characters from both opera appearing onstage throughout the evening. In fact both Mascagni and Leoncavallo themselves appear to watch the action they have written transpire onstage, and the prologue to Pagliacci is performed by the character Leoncavallo himself. Mamma Lucia also becomes a central figure commiserating with Marco Berti’s Canio in Pagliacci 6 months following the death of her son in the evenings first half. She also steals the last line of Pagliacci right out of Canio’s mouth. It wasn’t clear to me how successful this narrative approach was and it was just as puzzling at times as it was dramatically engaging. However, much about this performance seen on the 16th of September soared. Daniele Callegari elicited a well-paced and passionate performance from all the musical artists. The star of the afternoon was easily Dimitri Platanias, the Greek baritone who appeared as both Alfio and Tonio. He easily commanded the stage at all times and went further toward providing glue between the elements of both operas than any of the symbolic machinations of the set design. Jill Grove was a great Mamma Lucia and showed off her excellent acting chops in Pagliacci where she was often present with nothing to sing. Tenor Roberto Aronica goes back many years with this company and his Turiddu was a fine addition to the many roles he has excelled in here. The other opera opening this San Francisco Opera season was Donizetti’s Roberto Devereux. The opera is one of three that Donizetti wrote about England’s Tudor royal family. 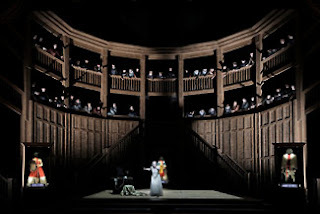 (The others being Anna Bolena and Maria Stuarda) So there are natural companions to this bel canto masterpiece, and many opera companies have presented them in series with appropriate vocal artists to fill thee very challenging leading roles. In this instance, SFO imported a recent production of Devereux from the Dallas Opera by Stephen Lawless. Lawless designed a circular stage mimicking an Elizabethan theater to compliment the time frame of the depicted events of the opera. In Dallas this set was used for all three of Donizetti’s Tudor operas over different seasons, but on this outing in San Francisco it stood alone, mostly as a vehicle for star soprano Sondra Radvanovsky. Given that the production was taken somewhat out of context of the trio it was originally intended for, elements of the staging that was suggestive of linkages between the works could seem confusing or out of place here including large glass display cases containing bodies for the assassinated victims of Donizetti’s other Tudor operas. Musically, this production seen on Friday September 14th wasn’t as solid as the verismo offerings. Radvanovsky is rightly a huge star. Her large, colorful tone has been the centerpiece of Verdi and Puccini performances all over the world for well over a decade. She has taken on these Tudor roles in the last several years including at the Metropolitan Opera in New York where she performed all three in a single season. And while she makes the role her own, the bel canto works are not as natural a fit for her as many of her other signature roles. She could turn overly steely at times and her Elizabeth was as likely to seem petty as regal. She was well matched by a world class cast including Russell Thomas in the title role and Jamie Barton as Sara who both gave warm, well-developed performances. Riccardo Frizza conducted the performance, which could have been a bit crisper. Still this is a prime change to see a A-level cast in a rarely performed opera.